Escape the urban bustle at Cheonggyecheon Stream and Bukhansan National Park. Popular historic sites such as Gyeongbokgung Palace and Changdeokgung Palace are in your itinerary. The adventure continues: get a taste of the local shopping with Myeongdong Shopping Street, examine the collection at World Jewellery Museum世界飾品博物館, get great views at N Seoul Tower, and take a stroll through Insadong. To find photos, other places to visit, ratings, and other tourist information, you can read our Seoul vacation trip planner. Vancouver, Canada to Seoul is an approximately 13.5-hour combination of flight and train. The time zone difference moving from Pacific Standard Time (PST) to Korea Standard Time (KST) is 17 hours. When traveling from Vancouver in April, plan for somewhat warmer days and about the same nights in Seoul: temperatures range from 20°C by day to 9°C at night. Cap off your sightseeing on the 8th (Sun) early enough to travel to Busan. 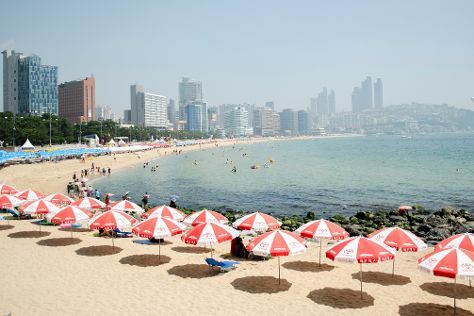 On the 8th (Sun), tour the pleasant surroundings at Gwangalli Beach and then hunt for treasures at Jagalchi Market. Here are some ideas for day two: enjoy the sand and surf at Haeundae Beach, kick back and relax at Songjeong Beach, and then take in the spiritual surroundings of Haedong Yonggung Temple. To see traveler tips, ratings, where to stay, and other tourist information, you can read our Busan custom trip planner. You can fly from Seoul to Busan in 2.5 hours. Other options are to take a train; or drive. Traveling from Seoul in April, expect nights in Busan to be about the same, around 9°C, while days are little chillier, around 9°C. Finish up your sightseeing early on the 10th (Tue) so you can travel to Jeju. Gwaneumsa Temple and Hallim Park are good opportunities to explore the local culture. Visit Hamdeok Beach and Gwakji Gwamul Beach for some beach relaxation. Step out of Jeju to go to Seogwipo and see Seongsan Ilchulbong, which is approximately 1h 20 min away. The adventure continues: delve into the lush surroundings at Hallasan National Park, explore the fascinating underground world of Manjanggul Cave, head off the coast to Udo, and take in the awesome beauty at Hallasan. 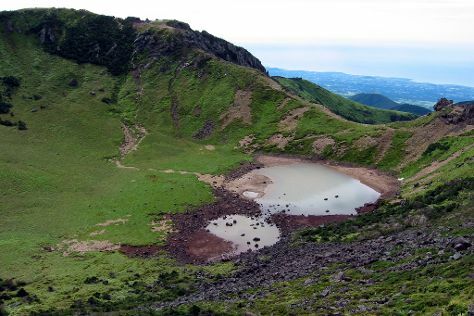 To find photos, maps, more things to do, and other tourist information, you can read our Jeju travel planner. Fly from Busan to Jeju in 2 hours. Alternatively, you can do a combination of car and ferry; or do a combination of bus and ferry. Traveling from Busan in April, expect nights in Jeju to be about the same, around 11°C, while days are a bit warmer, around 20°C. Finish your sightseeing early on the 14th (Sat) so you can travel back home.